The vitreous is a gel-like substance in the eye that is 99% water and is 1% collagen and hyaluronic acid. It makes up 80% of the volume of the eye and occupies the space between the lens and the back of the eye. 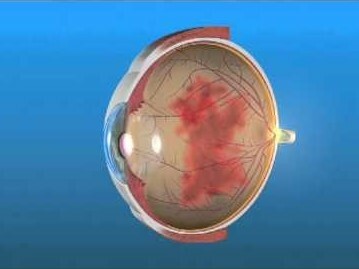 The vitreous is attached to the retina and to the optic nerve. When there is bleeding into the vitreous, this is called a vitreous hemorrhage. Symptoms of vitreous hemorrhage are varied but usually include floaters and/or painless loss of vision in one eye. Other symptoms include floaters, cobwebs, strings or lines in the vision, hazy or blurry vision, or shadows. The symptoms can be similar to a retinal detachment so a same day exam is usually recommended. Source: Spraul, C. W. and H. E. Grossniklaus, Surv Ophthalmol 1997;42(1):3–39. A complete examination consisting of a dilated exam is recommended. In some case additional testing may be necessary such as gonioscopy, and ultrasound. Dilated examination of the other eye is also important to help determine the cause of the vitreous hemorrhage in the affected eye and to identify any potential risk of a vitreous hemorrhage in the unaffected eye. Treatment of vitreous hemorrhage involved treating the underlying cause of the vitreous hemorrhage. Lasers may be used if the vitreous hemorrhage is caused by a retinal tear. If the hemorrhage is caused diabetes or vein occlusions, then treatment may involve medications injected into the eye. Surgery may even be required in the event of a retinal detachment or a vitreous hemorrhage that does not improve. Sometimes vitreous hemorrhages can also be watched carefully if there is no underlying pathology as the eye slowly clears the blood.